EATON — Robert L. and Ruth A. 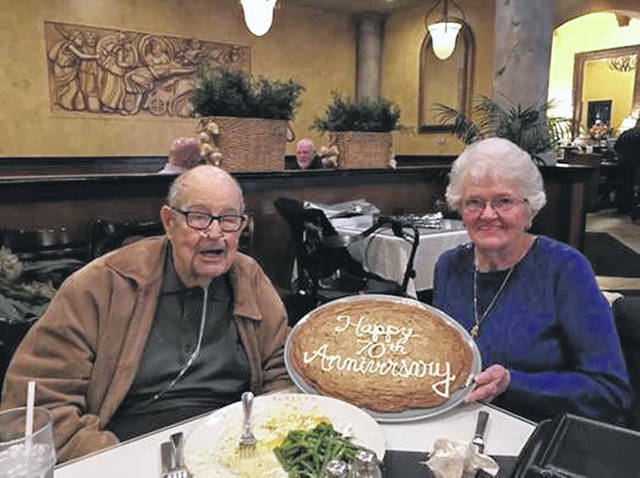 (Crowell) Miller are celebrating 70 years of marriage. The couple married Jan. 23, 1949, in Eaton. Bob & Ruth owned Miller’s Supermarket in Eaton. The supermarket opened in 1936 at the Main Street location in what is now Your Flower Shop. In 1957 they expanded and built Five Points Shopping Center, which housed Miller’s IGA and numerous other businesses. The grocery store closed in 2001. In addition, the Millers are known for their extensive collection of Hummel figurines. The Millers have two children, six grandchildren, eight great-grandchildren, and one great-great-grandchild on the way.